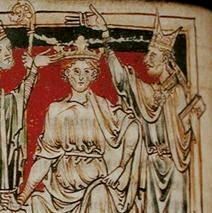 William I was the first Norman King of England, reigning from 1066 until his death in 1087. A descendant of Rollo, he was Duke of Normandy from 1035 onward. After a long struggle to establish his power, by 1060 his hold on Normandy was secure, and he launched the Norman conquest of England six years later. William's final years were marked by difficulties in his continental domains, troubles with his eldest son, and threatened invasions of England by the Danes. In 1086 William ordered the compilation of the Domesday Book, a survey listing all the landholdings in England along with their pre-Conquest and current holders. William died in September 1087 while leading a campaign in northern France, and was buried in Caen. His reign in England was marked by the construction of castles, the settling of a new Norman nobility on the land, and change in the composition of the English clergy.